HARLINGEN — As Tina Turner knocks out “What’s Love Got to Do With It” over the terminal’s speakers, the satisfaction of Valley International Airport’s top two managers is palpable. Showing off the sinuous curves of the new blue and white terrazzo tile floor, Marv Esterly and Bryan Wren are quick to say the new flooring is merely one of the more visible changes at the airport as the culmination of six years of phased projects comes to a conclusion. Last May, VIA opened a state-of-the-art, $3.8 million aircraft fire and rescue facility. The modernization of the electrical grid and the efficiencies produced by the new cooling system have dropped the average monthly power bill from about $35,000 to $20,000, a more than 40-percent savings. “It’s not just all lipstick on the outside,” says Esterly, director of aviation at VIA. The modernization of the Valley’s second-busiest passenger airport by enplanements after McAllen-Miller International Airport has come at a cost of $12 million. Esterly says the airport’s ability to modernize and remain debt-free brings benefits not just to airlines and air freight carriers at the airport, but passengers, too. “Air carriers look at an airport and look at what kind of revenues they can make and if they can keep ticket prices lower for our passengers, because they don’t have as much in capital expenditures or overhead, then they’ll be able to pass those cost savings over to the travelers as well,” Esterly said. From overhead comes the sound of power tools as one of the final phases of the modernization takes place. Work crews are climbing atop the massive white roof panels which form a dome over the terminal’s atrium, removing the old, yellowed panels and replacing them with new and lighter ones. The old ones are not just sun-faded, they were damaged by hail sometime in the past. Frontier Airlines recently began direct flights to Denver and Chicago, and in March American Airlines will add passenger service. Southwest Airlines, Delta Air Lines, United Airlines and Sun County Airlines all offer passenger service into and out of Harlingen. “We love each of our airlines equally,” Esterly says. “It’s not just about bringing new service in, or new carriers in, its about also adding additional capacity in the market that we already have. So a larger aircraft will add additional capacity. In 2018, the airport recorded a 12 percent increase in passenger enplanements. The airport is about to embark on a $15.5 million repaving job that will replace some worn and cracked runway apron that dates to the time it was called Harlingen Army Airfield. Plans are also in the works to lengthen the airport’s and the Valley’s longest runway, 17R/35L, from 8,301 feet to 9,400 feet to accommodate larger, wide-body jets. A new advertising agency was hired a year ago, and the result is visible inside the terminal. New displays are brighter and sharper. 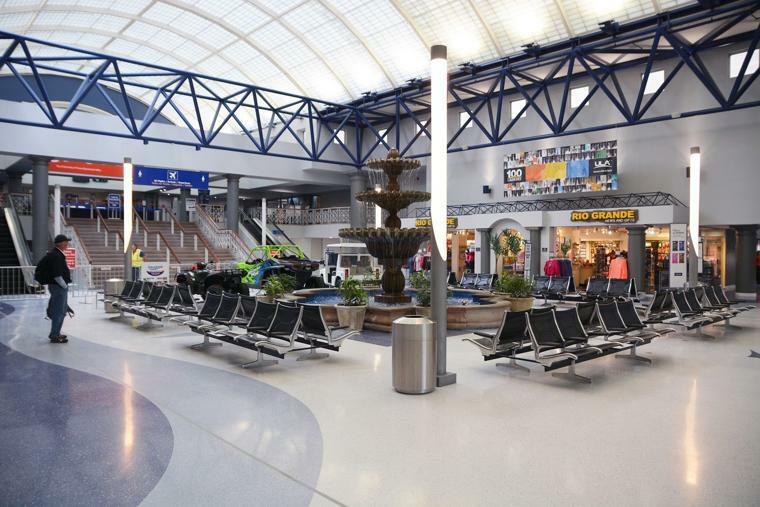 Yet of all the improvements, the $2.1 million terrazzo tile flooring may be the star. Installed by Mion Terrazzo Tile and Marble Co. of Harlingen and completed just two weeks ago, the tile replaced a 1980s-vintage brown and pink tile flooring which had seen its best days years ago. Esterly and Wren are happy to say the contractor, working at night mostly, was able to complete the project without any part of the terminal ever being shut down to the public. Standing above the airport’s logo, “VIA,” Esterly says embedding it into the terrazzo wasn’t part of the original contract that was bid. It may be an international airport, but in many ways the facility resembles a house, if you think about it like Esterly. The terrazzo at least will provide easy clean-up if any paint from the walls splashes down, and Esterly and Wren say like all the improvements at VIA, the new floor will be easier and cheaper to maintain. They bought a new floor cleaner “that’s like a Zamboni,” Wren says, referring to the iconic ice-rink refinisher.